Summary: 17-year-old Karou has a pretty interesting life, considering she has her own apartment in Prague and goes to art school. She’s a great mystery to her friends, never talking much about herself except to say with a wry smile that she doesn’t remember getting the eye-shaped tattoos on her palms, her hair is naturally blue, and the strange creatures she fills dozens of sketchbooks with, such as Issa, the snake woman, and Brimstone, the wishmonger, are real. Of course the creatures, called chimaera, are real–they’re the only family she has in the world. Her hair is naturally blue (because she wished that it was), and she knows as little about her mysterious tattoos as she knows about her past. When she’s not in school, she’s running errands for Brimstone, using portals to travel around the world and collect teeth for him, although she doesn’t know their purpose. Just when she’s on the brink of discovering who she is, all of the portals go up in flames. Karou is completely cut off from her family, and finds herself stalked relentlessly by a vengeful angel named Akiva, who might be able to reveal to her once and for all the secrets of her past. Daughter of Smoke and Bone is beautifully written, utterly fascinating, and doesn’t explain a single thing about what’s going on until the very end of the book. In the beginning we are introduced to Karou, who seems pretty normal despite having grown up in a small shop that deals primarily in teeth and wishes, surrounded by chimaera. She goes to art school and hangs out with her friend Zuzana at a local cafe called “Poison.” She has an insufferable ex-boyfriend who runs ghost/vampire tours around Prague. At first I was kind of annoyed by how little I knew about the world being presented to me. Karou herself seemed to know exactly what was going on, but the book takes its sweet time revealing information. This was especially irritating in regards to the “errands” Karou runs for Brimstone, which are only alluded to for the most part or shown in brief flashbacks. We find out that Karou is a great fighter, that she’s been shot at some point, and she’s seen some pretty terrible things. You get only brief glimpses of what her life is really like. It’s only after a while that you realize that Karou has no idea what the heck is going on either, and the book is actually about her discovering the world she has been part of her entire life without realizing it. Things really take off (*ba-dum ching! *) when we meet Akiva, who has been flying around the world with his angel buddies and scorching handprints into any door that acts as a portal to Brimstone’s shop. When Karou runs into him while on an errand, he attacks her without hesitation, and she only just manages to escape. Of course, Akiva is totally gorgeous. And, we learn, a tortured soul, turned cold and vengeful by terrible loss! The relationship between Akiva and Karou seems kind of forced, but it’s explained later. Normally I don’t go for the hyper-dramatic, inexplicably strong and sudden love-at-first-sight attraction thing. I just don’t find it believable. But if nothing else, this book is a testament to why it’s important to get to know someone too! Also, Laini’s writing is so pretty I completely let go of my usual misgivings and just fell into the story. So romantic!! That’s actually my main impression of this book. The world is totally interesting, the mystery engrossing (seriously, you do NOT know what is going on until the end), but the writing managed to be completely gorgeous and poetic without ever distracting from the story. Of course, my favorite relationship in the book was between Karou and Brimstone. He’s the only father she’s ever known, but he’s fairly cold and distant. It was absolutely adorable when he would reveal his true affection for her, if in his own stoic way. I hope we get to see more of them together later on. My favorite part of the book is at the end where you really start learning about Eretz, the world torn apart by eternal war between the chimaera and the seraphim. This place and plot developments were so interesting, I felt like I could have read an entire book just based on what happens there. I can’t really say more about the plot without spoiling everything, but at the end there are actually STILL some things you don’t know, so presumably all will be explained in the next book! -WHAT THE HECK IS GOING ON?? 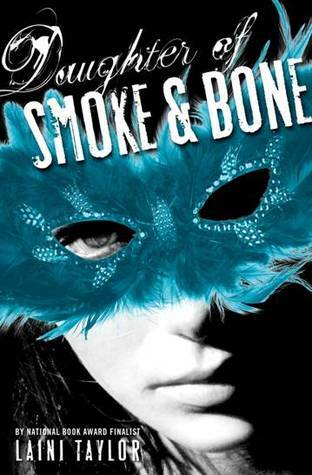 I thoroughly enjoyed Daughter of Smoke and Bone. If you’re in the mood for a great fantasy read, definitely check it out!